Once upon a time there lived a wise and benevolent Indian chief who had three squaws. He ruled his tribe with a fair and just hand and was considered the most learned and honorable chief among all the tribes. One day a strange white man, a trapper, appeared in the village to show his wares. Now the Indian chief wanted to get gifts for his three squaws so he begged the stranger to show him the various trinkets that he brought. The stranger laid out his trappings gathered from afar and the Indian chief was delighted to choose among them the gifts that he sought. For two of his squaws, he purchased from the stranger two horse hides of the finest quality. For his third squaw, his favorite, he wanted to buy something even more special. The stranger said that he had an item that might interest the chief and he showed him an article that the chief had never seen before – the hide of a hippopotamus. The chief was overwhelmed by this gift and paid much wampum for the hippopotamus hide. His squaws were delighted at the gifts that the chief purchased for them. Soon after, all three squaws became pregnant. The first two squaws – those who had received horse hides as presents – each gave birth to twin boys. The third squaw – the favorite squaw who received the gift of the hippopotamus hide – gave birth only to a single boy. This event caused great consternation in the tribe and there were murmurings that the son of the favorite squaw was somehow not as good as those of the first two squaws. These murmurings led to squabbles, then to arguments and then to wholesale outbreaks of rebellion. It was then that the chief showed his wisdom and put an end to the quarrels by gathering the tribe and laying down an edict that lasts to this very day. So great was the chief’s proclamation that it is taught in every classroom in every school throughout the land. 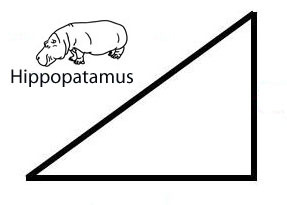 This entry was posted in Peculiar Science and tagged animals, hippopotamus, humor, Indian chief, mathematics, Pythagorean theorem, science, squaw. Bookmark the permalink. thank you so much! I needed this giggle so much today! 🙂 As for the comments, they’re almost as good. A big thank you all! always glad to give out giggles. I appreciate this kind of humour, much to my husband’s chagrin. I am also quite fond of your avatar. He’s so grouchy he’s cute. I’m chagrined that your husband’s chagrined. I haven’t learned yet how to tell a story about quadratic equations. Punny you should say that. I was just commenting on high compliments. I add this one to the list.